For the past few months or so since cutting my hair short, I've received numerous emails from you guys asking just how I style my curly waves. Being a relatively bone-straight hair girl myself, I've always been inclined to wear my hair with some type of curl in it, be it beachy waves or more defined spirals. We always want what we don't have, right? That said though, I hardly consider myself much of a hair guru and in fact, I'm pretty darn lost when it comes to styling anything that takes more than 30 minutes in the morning (hanging head in shame). So hopefully, what follows is easy enough to replicate and adapt for yourself and your hair type. As for my hair type? The "before" photo you see above is what my hair looks like with little to no styling done to it. Since my hair is very thick, I generally wash my hair in the evenings, drying it before I go to bed. This allows it time to relax, making it much easier to manage in the morning! 1.) Before beginning, I'd like to note that I mentally divide my hair into three sections: left, right and the (dreaded) back section. I say "mentally" only because, while I've tried sectioning my hair with hair clips, I've found that I like sorting curled sections and non-curled sections apart by hand as it helps relax the curl and in the end, makes it look more natural. I suggest trying both ways and see what works best for you and what you're most comfortable with. With that in mind, I take a 3/4" inch curling iron (I use this one by Conair) and start on my left side, with the top layers and face framing layers first, then make my way to the layers underneath. Since cutting my hair shorter, I've had to get used to taking much smaller chunks of hair to curl at a time. My general rule of thumb is to keep each section you curl right around the width of a pencil for top layers and a bit larger for bottom layers (about the width of a marker). 2.) Now I comb through my curls with my fingers, making sure to separate them a bit. I don't spritz hair spray just yet though -- we'll save that for later. 3.) and 4.) At this point, I repeat what I did on the left side to the right side, making sure to still curl toward the back of my head. Which brings me to the aforementioned back of the head. This section kills me every time but luckily, since we're going for a more relaxed overall wave, it doesn't need to be perfect. Just try to keep the same size sections as you were on the right and left sides and you'll be surprised at how quickly you eventually get the hang of it (I promise!). Once I think I've covered all my bases, I usually enlist the help of the man friend to check the back (important to make sure that whoever you ask is actually looking and not checking their iPad or some other distraction instead). After this, I leave the curling iron plugged in, do another round of finger combing and go about my morning. Since I like to let the curls fall and relax naturally, I find that the best time to spritz hair spray is right before I leave, about 15 -20 minutes after I've finished curling. Sometimes, I'll do a few last minute touch ups and re-curl the top layers if I want more definition, otherwise, I'm ready to head out the door! It is a great tutorial. I wonder if you have a Youtube account so that I can just watch your essay writing service tutorials. But then again, I haven't totally explored your site. I will and I'm doing it now. I definitely prefer waves, and you know how to do them! Thanks for the tips! Your hair always looks amazing & I've always wondered how you achieved this look. Wow that looks great! Thanks for the tutorial! Where did you get your amazing neon tshirt? super cute! you look great either way...! Your hair always looks great, so no wonder why! i'm so jealous of your gorgeous thick hair! i'm so used to you with this short hair now that i can't believe you ever had long hair...ha ha! i love it both ways. I recently chopped my hair as well and have been using a 1/2 inch barrel which is not working for me as well as it did for my long locks. I may need to try the bigger barrel (which seems odd but your hair proves it wrong obviously!) thanks for the tips! Your hair looks great either way, but I love the curls! Also, I wish that J.Crew top was still in stock! :( LOL. Thank you so much for sharing! I've recently been playing with curl and can't wait to try out your suggestions! great tutorial! since I chopped my hair off I've been scared to curl it for fear of looking like a poodle...lol but I'll have to get over that and try it out! Love your hair! love the shirt and the necklace!!! Love this tutorial ! Great post ! Your hair is great! I am so jealous that it dries that naturally straight and beautiful. Sigh...Good tips! pretty! what kind of spritz do you use? I love your hair! I'm still not brave enough to just chop mine off but after Lucky FABB I went to my hair appointment and cut about 2 inches off. It was at armpit length for awhile but now it's starting to grow back a bit. I don't think I can be brave as you - but you pull off the short hair perfect! Oh, and do you only use spritz hair spray? Or aerosol? I got a BUNCH of Aussie spritz hair spray from a contest at FABB and I don't use spritz...so if you want it - it's all yours! Love it! Your hair looks so healthy and pretty! I love your hair, both long and short! So cute right now with the bob! Thank you for this Krystal! I always liked your hairdo a lot, but this cut is really phenomenal! I actually have curly hair, but it's thin with frizzy poodle-y curls so I always blow them straight... which takes about 20-30 minutes. I always thought that styling nice wavy curls would take a lot longer, but looks like it's 30 minutes as well! What kind of spray do you use? I'm so glad you did a post on how to curl your hair! Since being new to having short hair I have been very hesitant to try my hand at curling it but miss having curls. You've inspired me to try it with my short hair now so thank you! and jealous that you rock short hair so well! gorgeous, you have amazing hair! Love your hair! You look gorgeous...so nice to see you without your sunnies covering up those lovely peepers. Oh my goodness, I love the way you set up this tutorial & I really, really want your top! Love the post¡ Very good explained¡ Do you use any thermal protector before the iron? Your hair looks amazing before and after! 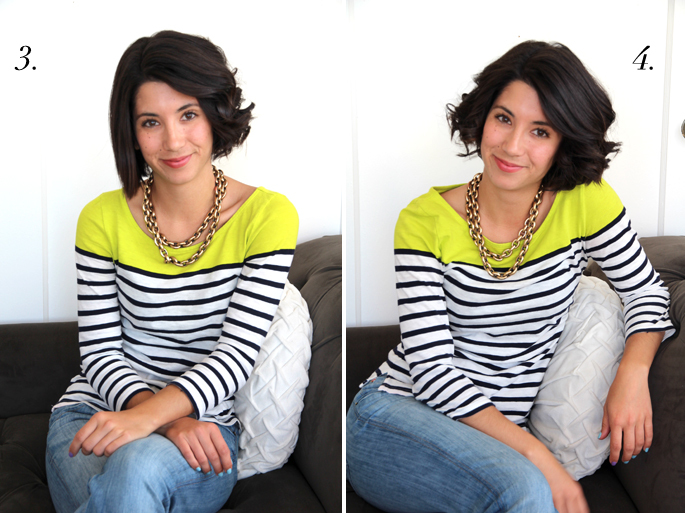 Totally having short hair envy. Love the shirt and necklace too! Im so bad at doing this! But I will try it your way! Amazing results thanks for sharing! gorgeous! I am so glad you posted this! I'm getting ready to donate my hair and when I cut it short, I was worried I wouldn't have any alternatives to down and straight. I think your hair looks great either way, though... Thanks! Yes- thank you for doing this post! I recently cut my hair from very long to above the shoulders & have had several styles done to it since then. I am going to try this for the weekend & see how it goes! i actually love it both before and after! win-win. 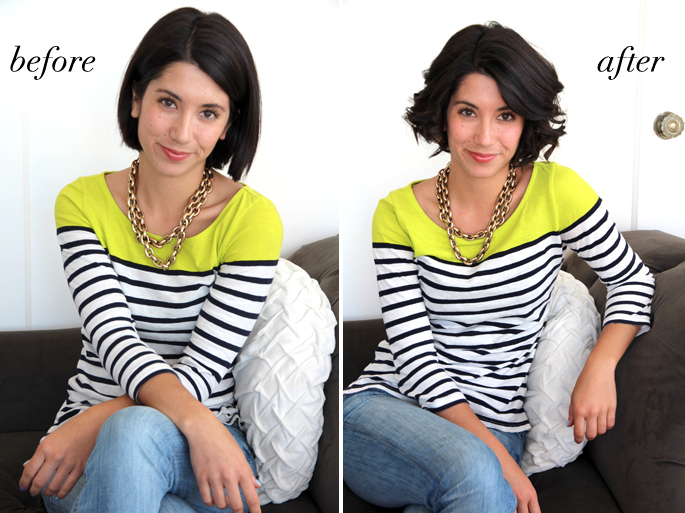 You look great with a wavy bob! You look great either way... the decision is hard to pick a favorite. Each style lends itself to such a different look! That was very helpful !!! Thanks !!! Hey there Krystal! I love this tutorial- actually needed something like this! Since I'm naturally a curly haired gal, I never before used an iron unless it was to straighten , but I find myself drawn to a perfectly curled curl! So this is def helpful! 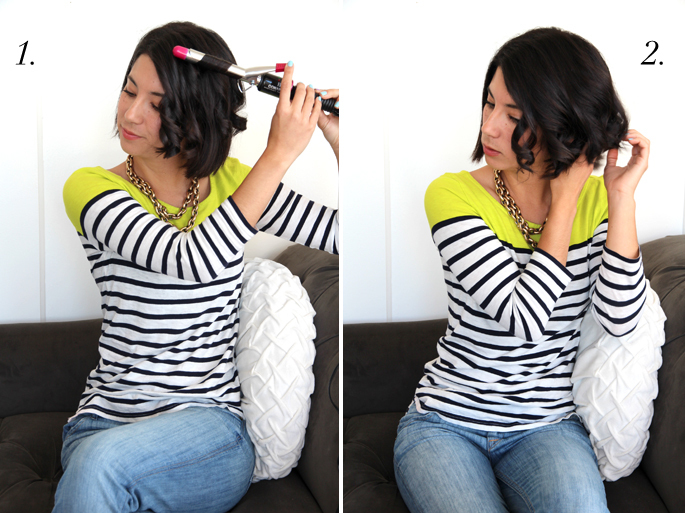 Great tutorial for getting that perfect curl. Nice tutorial! !Your hair looks amazing and My hair is so heavy and thick can I try it. The final result is good for your face.Its really give more good look to you.. I think it is a great tutorial for me . I also want to curl my hair . Thanks for your great tutorial . You are done a great a work indeed this post so keep it up for more post regard. I used to curl and style my hair this way during the summer, its such a fun hairstyle! I love it. Great tutorial and I loved your locks. I have a similar hair cut as of yours and was planning to curl them but wasn’t sure how they would look. Now I am going to buy a good curling iron and then will share the pics with you here.